While I was at Nature in Art I gave a talk on the Thursday evening. Last year I illustrated a book for a wildlife photographer and professional safari guide called Steven Stockhall. He is based in Botswana and we met while on safari in 2004 when he asked me if I would illustrate a book of his photographs. 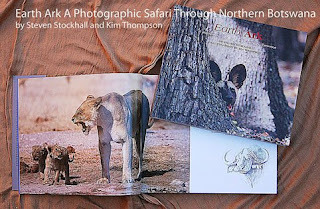 In May 2008 we published a book called 'Earth Ark a photographic safari through northern Botswana' and embarked on a six week promotional tour and book launch across South Africa and up to Botswana. It was an epic journey! The talk at Nature in Art was about the book and the region of Northern Botswana which inspired its creation. I hope it proved an interesting and inspiring evening for all who attended. I know there were a lot of keen photographers and well travelled wildlife enthusiasts in the audience. This was my first attempt at using power point to present a slide show. Great fun to assemble all the images. 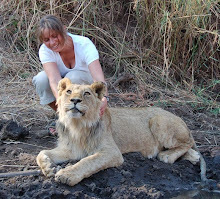 Good job I enjoy talking about Botswana and its fantastic wildlife!